Lonnie V. Hunter III made his stunning debut on the Malaco Records label with the contemporary CD Lonnie Hunter and the Voices of St. Mark. 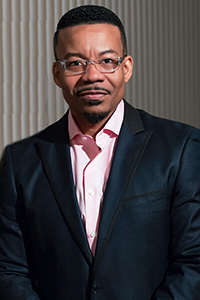 An accomplished vocalist, organist, director, and actor, Pastor Hunter is making an everlasting impact within gospel music today – and here at Bethany Baptist as our Worship Pastor. Minister Hunter, whose roots are in Harvey, Illinois, was inspired to sing gospel by his mother, who herself was a prominent gospel singer. After high school, Lonnie joined the U.S. Air Force where he served as lead vocalist for the U.S.A.F. Jazz Band. While in the Air Force, Lonnie attended Western Illinois University, where he earned his Bachelors of Arts Degree in Public Relations. After winning several national choir competitions, he went on to serve as host and emcee for the 10-city tour of the Wrigley Gospel Choir Competitions sponsored by the William Wrigley Jr. Company. If that weren’t enough, Lonnie was the host of the most successful morning show in Chicago on WGCI Gospel Radio 1390 for four consecutive years. A testimony to his devotion to music, Lonnie has been the Minister of Music for St. Mark Missionary Baptist Church for the past 23 years – and now he also serves as Bethany Baptist’s Worship Pastor. Minister Hunter is also President and CEO of Hunter Communication Group, a public relations firm. He also received the “Pinnacle Award Achievement for Businessman of the Year” awarded by the Gillette Corporation and Being Single magazine.